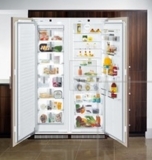 Shop our large selection of Liebherr residential refrigeration units. Liebherr refrigerators transform your kitchen: with contemporary design, pristine finishing and premium quality controls. When you purchase a qualifying Liebherr Refrigerator. Click for Details | Ends Dec 31, 2018.